LOUISVILLE, Ky. (Wednesday, May 2, 2018) – All entrants but one for the Kentucky Derby and Kentucky Oaks were on the track at Churchill Downs on a balmy Wednesday morning in Kentucky. The one is UAE Derby (Grade II) winner Mendelssohn, who is expected to clear quarantine later today and be on the track Thursday morning. Trained by Aiden O’Brien, Mendelssohn has walked under tack with a rider up in the shedrow the past two mornings. AUDIBLE/MAGNUM MOON/NOBLE INDY/VINO ROSSO – Trainer Todd Pletcher stayed on schedule with his quartet of Kentucky Derby runners, sending the four colts trackside Wednesday morning at Churchill Downs during the special Derby/Oaks training period at 7:30 for steady gallops around the historic Kentucky oval. Audible (with regular exercise rider Amelia Green attached), Magnum Moon (Nick Bush up), Noble Indy (Carlos Cano the rider) and Vino Rosso (Adele Bellinger aboard) all galloped a mile and a quarter on a delightful weather morning. The only variance in the group came with Noble Indy’s side trip to the starting gate, where he stood briefly. Pletcher, whose record seven Eclipse Awards as the nation’s leading trainer was built on discipline, order and attention to detail, has all of those things in play this week as pressure builds, the crowd around his Barn 40 grows and racing’s most noteworthy prize looms for Saturday. Steady, steady, steadily – the Pletcher juggernaut moves ahead. Bush was asked which of the many attributes he admires most in his Derby charge – the undefeated colt Magnum Moon, winner of the Arkansas Derby (Grade I) in his most recent outing. Magnum Moon and his three stablemates will continue their Pletcher Plan education today by heading over to the paddock with the horses for the fifth race. Magnum Moon and Vino Rosso will be visiting the saddling enclosure for the first time this week. In the case of Audible and Noble Indy, it will be their second straight day. Audible is owned by the four-way partnership of China Horse Club International, Head of Plains Partners, Starlight Racing and WinStar Farm. Magnum Moon goes in the silks of Lawana and Robert Low. Noble Indy races for WinStar Farm and Repole Stable, while Vino Rosso’s connections are Repole Stable and St. Elias Stable. BLENDED CITIZEN – The Kentucky Derby’s lone also-eligible went about his business as if he might catch that “I can run” break in the next two days, galloping a mile and three-eighths under Jonny Garcia during the special Oaks/Derby training period Wednesday at Churchill Downs. The Proud Citizen colt has a rider (Kyle Frey) named, has the green light from his owners (Greg Hall and SAYJAY Racing), has nine starts and a fitness edge over many of his potential Derby rivals – he’s just a tad shy of Derby points and has to hope that one of the other current 20 already-entered starters stubs a toe or has a change of heart before 9 a.m. Friday. California-based trainer Doug O’Neill’s right-hand man, Jack Sisterton, who is overseeing the colt in Kentucky, is keeping a good thought and hoping for a bit of luck. “Fingers crossed,” he said Wednesday morning at Barn 43. BOLT D’ORO – Ruis Racing LLC’s Bolt d’Oro schooled in the starting gate before galloping 1 ¼ miles under exercise rider Jose Velazquez at Churchill Downs Wednesday morning. The son of Medaglia d’Oro is schooled in the paddock during Wednesday’s first race. Bolt d’Oro is rated at 8-1 in the Kentucky Derby morning line in which undefeated Santa Anita Derby winner Justify is favored at 3-1. Owner/trainer Mick Ruis was asked if Justify weren’t in the Derby, if his Santa Anita Derby runner-up might have been favored. “Or if anyone other than Mick Ruis trained him, he might be favorite,” Ruis joked. Ruis may be light on Kentucky Derby and Triple Crown experience but he doesn’t lack confidence in Bolt d’Oro’s chances for victory Saturday. Ruis said he also put $1,200 on Bolt d’Oro in Las Vegas when he was 40-1 last year. Jockey Victor Espinoza, who will ride Bolt d’Oro for the first time in a race Saturday, was on hand to watch Bolt d’Oro train Wednesday morning. The three-time Kentucky Derby winner’s confidence in Bolt d’Oro also has been very high since being named to replace Javier Castellano, who opted to ride Audible in the Derby. Espinoza said his approach to riding in the Kentucky Derby is different than his approach to everyday races. Espinoza has been aboard Bolt D’Oro for two workouts at Santa Anita. BRAVAZO – Calumet Farm’s Risen Star (GII) winner Bravazo continued his same routine from the past few days, going out to train at 7:30 a.m. and galloping 1 ½ miles under Danielle Rosier, who described him as “one of the classiest horses” she’s ever been on and complimented him on how well he’s handling the morning crowds. Trainer D. Wayne Lukas was also very complimentary of the Awesome Again colt. “He does everything right,” Lukas said. “He’s a real, real nice horse to be around. He’s not hard to train. Combatant’s connections were hoping for a luckier draw Tuesday after being stuck on the far outside in his past three races but drew the 20 hole for the Kentucky Derby. “Maybe it will be the spot to be this year,” Asmussen said. “We were so worried last year about Lookin At Lee (the eventual second-place finisher) drawing the one hole and then the two horse (Thunder Snow) came out bucking, leaving us nothing but room. Noble Indy, who is directly to our inside, is capable of some pace, so we’ll just follow him out. We’ll let him clear a path for us and we should keep our face clean for at least the first eighth of a mile. “Obviously, it’s not (the post) I was looking for. The horse has just been horribly unlucky with his draws. The difference with the Derby is you at least have a quarter mile into the first turn. When you’re only going a mile and a sixteenth, a mile and an eighth, you have very few options. ENTICED – Godolphin LLC’s Enticed schooled in the starting gate before galloping 1 ½ miles under exercise rider Jason Gracia Wednesday morning. “We backed him up to the gate and stood him. It’s always nice to have the gate crew get to know your horse. He does nothing wrong. Sometimes you have to school them because they’re a problem, but he’s a perfect gentleman, and they got to see that,” trainer Kiaran McLaughlin said. Enticed will be McLaughlin’s eighth Kentucky Derby starter. The Lexington, Kentucky, native came closest to winning with his first starter, Closing Argument, who finished second in 2005. Adding a Kentucky Derby victory to his already impressive training resume is obviously a goal. A victory by Enticed would be a special occasion for his trainer. “This is special because he’s out of It’s Tricky, who we trained, and is a homebred by Medaglia d’Oro,” said McLaughlin, who saddled It’s Tricky for multiple Grade I wins in 2011-12. Does Enticed remind McLaughlin of It’s Tricky? FIRENZE FIRE – Mr. Amore Stable’s Firenze Fire jogged five-eighths of a mile and galloped a mile Wednesday morning at Churchill Downs. The son of Poseidon’s Warrior will be his trainer’s first Kentucky Derby starter, but Jason Servis has plenty of Derby Day experience. “I’ve been here a few times. My sister owned Itsmyluckyday and I was here for Smarty (Jones),” said Servis, the brother of Laurie Plesa, who co-owned Itsmyluckyday, who finished 15th in 2013 before finishing second in the Preakness, and John Servis, who saddled Smarty Jones for victories in the 2014 Kentucky Derby and Preakness prior to a second-place finish in the Belmont Stakes. Jason Servis recalled the pressure surrounding Smarty Jones’ Derby run. FLAMEAWAY – During the 7:30-7:45 training period for Kentucky Derby and Oaks horses, John Oxley’s Flameaway jogged a mile with regular rider Chris Garraway, ponied by trainer Mark Casse’s assistant Nick Tomlinson, and galloped a mile on his own. He also stood in the starting gate for the second morning in a row. With three days to go before the Derby, Casse thinks Good Magic and Justify stand out amongst the competition. FREE DROP BILLY/PROMISES FULFILLED – Dennis Albaugh’s Albaugh Family Stables’ Free Drop Billy and Bob Baron’s Promises Fulfilled galloped 1 ½ miles Wednesday morning at 7:30 for trainer Dale Romans. Blue Grass third Free Drop Billy drew post two for the Kentucky Derby and will be ridden by Robby Albarado. Late Tuesday night Free Drop Billy’s namesake, Bill Collins, arrived in Kentucky and was able to meet his namesake Wednesday morning at Churchill Downs. Baron joined Albaugh and Collins at Romans’ Barn 4 to watch his Fountain of Youth (GII) winner Promises Fulfilled train. The colt will break from post three in the Derby with Corey Lanerie aboard. GOOD MAGIC – Good vibrations continue to emanate from the barn of Good Magic, last year’s Eclipse Award-winning Champion 2-Year-Old Male owned by e Five Racing Thoroughbreds & Stonestreet Stables LLC. The Blue Grass Stakes (GII) winner had another enthusiastic gallop, going 1 3/8 miles during the Derby training session, following not far behind Justify, just as he expects to do Saturday. It was clear that Good Magic wanted exercise rider Walter Malasquez to let him do more. If you were to make your Derby bets on the basis of trainer vibes, Chad Brown, winner of the past two Eclipse Award’s as the nation’s Outstanding Trainer, would have to be on every ticket. Brown has said this week that it’s his horse’s progress that has him in high spirits, but co-owner Bob Edwards of e Five, suggests it goes deeper than that. Edwards built a pharmaceutical company that he sold for more than $200 million with a laid-back approach in a traditionally buttoned-up industry and only half-jokingly takes credit for rubbing off on Brown. The vibes extend to the colt’s prescient name, which started with his dam, Glinda the Good, a multiple stakes winner for Stonestreet named for Glinda the Good Witch from the Land of Oz in The Wonderful Wizard of Oz. “It was a back and forth but there was Glinda the Good Witch and there was some magic involved and we just ended up with Good Magic,” Edwards said. Good Magic will school in the paddock during today’s fourth race. HOFBURG – Juddmonte Farms Inc.’s homebred Florida Derby (G1) runner-up Hofburg visited the paddock, galloped 1 1/2 miles under exercise rider Penny Gardiner and stood in the starting gate during the Derby training session. In a 40-year Hall of Fame career with wins in most of the world’s biggest dirt stakes, Mott has had eight Derby starters. His best finish came with 1997 Horse of the Year Favorite Trick, eighth in 1998. INSTILLED REGARD – OXO equine LLC’s Jerry Hollendorfer-trained Kentucky Derby (GI) contender Instilled Regard left Barn 41 at 7:30 a.m. with exercise rider Edgar Rodriguez aboard. Accompanied by a pony, he was followed closely on foot by Jerry Hollendorfer’s traveling assistant and bloodstock agent, Christina Jelm. In seven career starts, the son of Arch has hit the board five times, including a victory in January’s Lecomte Stakes (GIII), a second in the Los Alamitos Cash Call Futurity (G1) and a pair of fourths in his past two efforts, the Risen Star Stakes (GII) and Santa Anita Derby (GI). “I think he’s matured a lot mentally and physically,” Jelm explained. “I don’t think we’ve seen the bottom of this horse and I think we should throw out his last two races. Shipping over to the Risen Star (at Fair Grounds in New Orleans) didn’t go well and then being so far back in the Santa Anita Derby was just too much to ask of him to close that amount of ground. JUSTIFY/SOLOMINI – Undefeated Kentucky Derby favorite Justify – owned by China Horse Club International Ltd., Head of Plains Partners, Starlight Racing & WinStar Farm LLC – visited the starting gate at 7:30 a.m. during the Derby training session before galloping 1 1/2 miles under exercise rider Humberto Gomez. 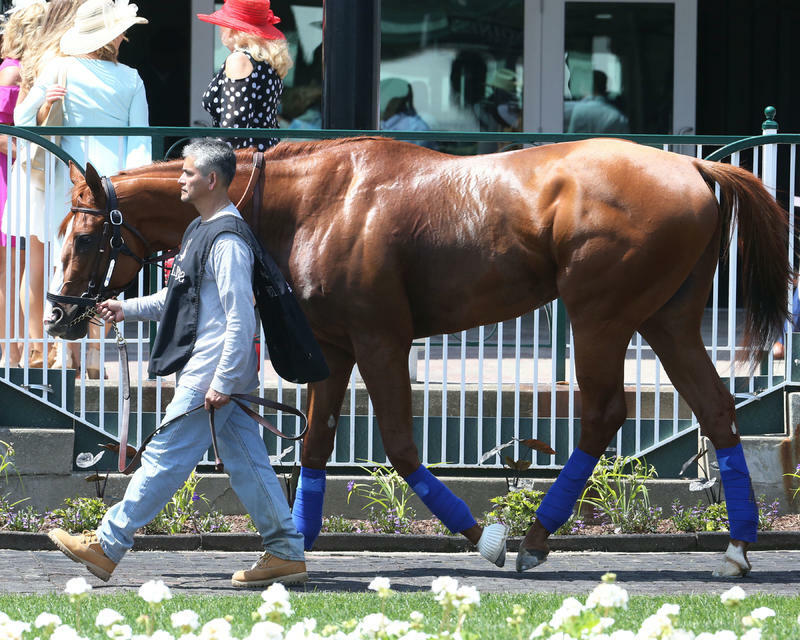 Once the Santa Anita Derby (GI) winner returned to barn 33, Gomez hopped aboard Solomini – owned by Zayat Stables LLC, Mrs. John Magnier, Michael B. Tabor & Derrick Smith – to follow the same routine. “They’re here and they’re still doing well,” Baffert said. As tends to happen this time of year, talk around the Baffert barn always seems to circle back to American Pharoah, the 2015 Derby winner who went on to end a 37-year Triple Crown drought. Baffert said he has plans to visit Central Kentucky on Thursday and say hello to a few of his favorites. American Pharoah stands at Coolmore America’s Ashford Stud in Versailles, Ky., while some of his other best runners are living out their days at Old Friends Retirement Center in Georgetown, Ky.
“I’ll go see Pharoah, Silver Charm, Game On Dude,” Baffert said. “With Pharoah, Jill’s always so afraid that he’ll forget who she is. We’re in awe of him. He’s this big, unbelievable horse and there’s so many good feelings about him. Every time I see him it looks like he’s getting bigger. He was unbelievable. And they let me lead him around and they let me hold him and stuff so that’s pretty cool. And I have an American Pharoah baby I have to go check out, too. Justify and Solomini schooled in the paddock during today’s first race. LONE SAILOR – G M B Racing’s Lone Sailor galloped 1 ½ miles at 7:30 a.m. Wednesday with exercise rider Maurice Sanchez aboard for trainer Tom Amoss. Lone Sailor drew post No. 8 and will be ridden by James Graham. MENDELSSOHN – Michael B. Tabor, Mrs. John Magnier and Derrick Smith’s Kentucky Derby (GI) contender Mendelssohn remained in quarantine, Barn 17, at Churchill Downs on Wednesday morning. The Aidan O'Brien trainee walked the shedrow and will likely clear by late Wednesday afternoon and is expected to train Thursday morning in what is his first time in America since annexing November's Breeders' Cup Juvenile Turf (GI) at Del Mar in California. MY BOY JACK – The dark stretch-runner with the most extensive resume in Kentucky Derby 144 had a relatively easy morning of it Wednesday at Churchill Downs, merely jogging the wrong way around the big track under exerciser rider Peedy Landry accompanied by a stable pony during the special Oaks/Derby training period. The Cajun horseman by way of Carencro, Louisiana, Landry had his own special way of stating the morning’s exercise that saw his colt and his partner circumnavigate the big oval once, then again. “We went once around – twice,” he said. However you wanted to say it, trainer Keith Desormeaux said he was pleased with the Creative Cause colt’s exercise and his general attitude coming up to his Saturday date with destiny. My Boy Jack already has 10 starts under his belt, the most by any of this year’s Derby runners. His record reads 10-3-3-2 with $645,145 in earnings heading into the mile and a quarter classic. The bargain $20,000 yearling purchase has a trio of partners – Don’t Tell My Wife Stables, Monomoy Stables and West Point Thoroughbreds. He’ll also have his regular rider Saturday -- Hall of Famer Kent Desormeaux, who is, of course, a full brother to the colt’s conditioner. Keith Desormeaux indicated My Boy Jack would continue his schooling/training by going to the paddock Wednesday afternoon with the runners for the afternoon’s second race. CHOCOLATE MARTINI – David Walker and Amanda DaBruzzo’s Double Doors Racing’s Fair Grounds Oaks (GII) winner Chocolate Martini galloped 1 ½ miles Wednesday morning for trainer Tom Amoss. Chocolate Martini was claimed by $25,000 by Amoss in early February and subsequently won an allowance race and Fair Grounds Oaks (GII). Kentucky Oaks day is an annual celebration of women, featuring the Pink Out, Longines Kentucky Oaks Fashion Contest and the Survivors Parade Presented by Kroger that benefits breast cancer awareness. Chocolate Martini drew post position four in the Kentucky Oaks and is 12-1 on the morning line. Jockey Javier Castellano has the call. CLASSY ACT/PATRONA MARGARITA – Craig Upham’s Patrona Margarita continued her early morning schedule when she galloped 1 1/2 miles Wednesday for trainer Bret Calhoun. Stablemate Classy Act trained at 7:30 Wednesday morning and galloped 1 ½ miles before schooling in the gate with Peter Mudd aboard. Brian Hernandez Jr. has the mount on Classy Act (15-1 morning line) and will break from post position three while Ricardo Santana Jr. has the call on Patrona Margarita (30-1) and will break from post position 12. COACH ROCKS – Roddy Valente, RAP Racing and West Point Thoroughbreds’ Coach Rocks galloped 1 ½ miles Wednesday morning at 7:30 for Churchill Downs’ all-time leading trainer Dale Romans. Coach Rocks drew post No. 2 for the Longines Kentucky Oaks (GI) and is 12-1 on the morning line. ESKIMO KISSES – Magdalena Racing, Gainesway Stable and Harold Lerner’s Eskimo Kisses galloped 1 ½ miles Wednesday under exercise rider Mario Conbento for trainer Kenny McPeek. HEAVENHASMYNIKKI – Loooch Racing Stables’ Heavenhasmynikki galloped a mile and a half under Oaks rider Calvin Borel Wednesday morning. The Ohio-bred filly has won one of her four starts but is graded-stakes placed with a third in the Davona Dale (GII) in her most recent start. In Friday’s Oaks, she will racing around two turns for the first time in her career. Heavenhasmynikki has worked twice at Churchill Downs; a five-furlong move in 1:02.60 on April 20 and then another five-eighths drill last Friday in 1:01. MIDNIGHT BISOU -- Trainer Bill Spawr called an audible with his Kentucky Oaks filly Midnight Bisou and, instead of sending her out at 5:30 Wednesday morning as he had planned, went to the track with her at 7:30 to take advantage of the special Oaks/Derby training period at Churchill Downs. The reason for the switch was so that his daughter of Midnight Lute could also take a tour of the paddock at the later hour, which, in fact, she did under exercise rider Jesus Camacho. In addition to paddocking, Midnight Bisou put in a solid gallop of a mile and a quarter and Spawr and co-owner Jeff Bloom (Bloom Racing Stable) looked on from the track’s backstretch, heavily populated with family, friends and many racing fans on a delightful Kentucky morning. Spawr said his charge would get a further feel for the paddock Wednesday afternoon when she comes over with horses for the day’s second race. “We’ll see how she does over there this afternoon and that will tell us whether or not we’ll need to take her back tomorrow,” the veteran trainer offered. The three-time stakes winner also is owned by Allen Racing and brings a bankroll of $450,000 and a record of 5-3-2-0 into the $1 million, Grade I Oaks. MONOMOY GIRL/SASSY SIENNA/KELLY’S HUMOR – Trainer Brad Cox continued to send his trio of Oaks fillies to the track together during the special 7:30 a.m. training time. Each one stood in the gate and galloped 1 3/8 miles. Monomoy Girl was particular keen Wednesday in her gallop, but the trainer said that’s just how the filly is. While this will be the first time Cox, whose career has been on the rise over the past three years, has started horses in the Kentucky Oaks, the Louisville native is no stranger to success of Churchill’s biggest weekend. Last year, he won three stakes – the Eight Belles (GII), American Turf Stakes (GII) and the TwinSpires Turf Sprint (GIII) – and an allowance race. MY MISS LILLY – Trainer Mark Hennig said My Miss Lilly looked “excellent” this morning as she made a few laps in the paddock before galloping 1 ¼ miles under exercise rider Emerson Chavez. My Miss Lilly, who won the Gazelle (GII) at Aqueduct and is owned by Courtlandt Farms, is stabled in barn 37 with trainer Dallas Stewart’s horses. Hennig and Stewart are longtime friends and colleagues, learning together while working as assistants to Hall of Fame trainer D. Wayne Lukas. Hennig has plenty of stories from his times running a division at Churchill Downs for Lukas with Stewart as his barn foreman. He said if there is one thing they have learned from one another, it is to be adaptable. RAYYA – Sheikh Rashid Bin Humaid Al Nuaimi’s UAE Derby (GII) runner-up Rayya galloped about 1 1/2 miles under exercise rider Dana Barnes during the Oaks and Derby training session. Three-time Oaks winner Bob Baffert took over Rayya’s training from Doug Watson following the UAE Derby. She didn’t have an official work for Baffert until April 21, when he put her in company from the gate with last year’s Oaks winner, Abel Tasman, who is set to run in Friday’s La Troienne (GI). The speedy Rayya broke on top and cleared last year’s champion 3-Year-Old Filly, but Abel Tasman made up the ground and finished just a tad ahead at the wire. The work served as a way for Baffert to gauge what he might have in Rayya, who was 18 lengths behind Mendelssohn but three lengths clear of multiple stakes winner Reride in the UAE Derby. TAKE CHARGE PAULA – Peter Deutsch’s Take Charge Paula schooled in the paddock and galloped 1 3/8 miles under Jason Gracia Wednesday morning at Churchill Downs. “We didn’t school her in the gate, but we did school her in the paddock,” said trainer Kiaran McLaughlin, who later in the morning schooled Kentucky Derby entrant Enticed in the starting gate but not the paddock. WONDER GADOT – Wednesday morning, Gary Barber’s Wonder Gadot galloped 1 ¼ miles with regular rider Orlando Cross during the 7:30-7:45 training period for Kentucky Derby and Oaks horses. When asked to describe a unique characteristic about Wonder Gadot and his Derby horse Flameaway, Casse stared down his shedrow and thought for a moment. Then he mused about their quirks. “I think if you took him (Flameaway) out right now and you dropped the shank, I don’t think he would run,” Casse said. “Wonder Gadot, we’d be like…” Casse looked off into the distance, as though staring after a runaway horse. Another fact: Wonder Gadot can fly… in her own way.